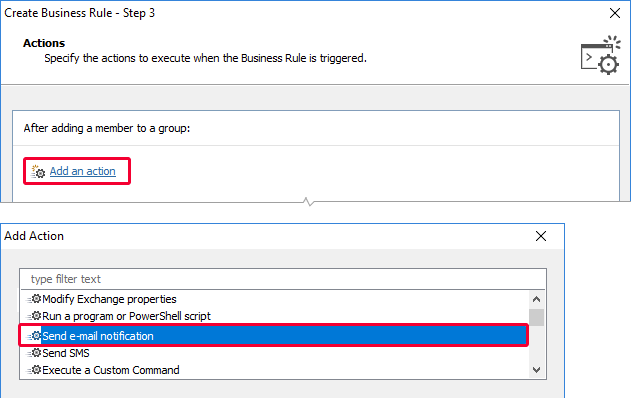 You can configure Adaxes to send an email notification when an operation takes place in Active Directory. In this tutorial, you will learn how to send an email message when a new member is added to an Active Directory group. To automatically perform actions when a certain event takes place, you need to use Business Rules. 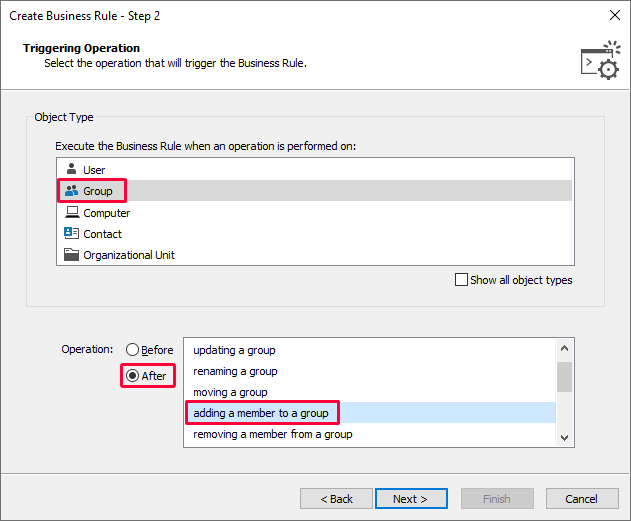 To send notifications about new members, you need to create a Business Rule that will be triggered after a member is added to a group. 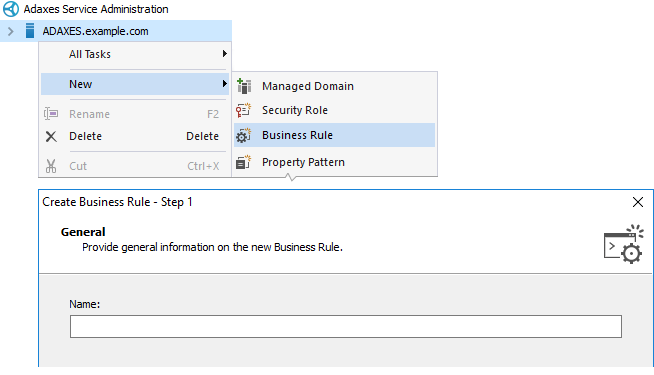 Enter the name for the new Business Rule and click Next. Select After and then select Adding a member to a Group. Click Add an action and select the Send e-mail notification action. In the Action Parameters section customize the email notification template. To insert information about the group, new member and operation initiator, you need to use value references. %mail% - the email address of the group. %adm-InitiatorEmail% - the email address of the operation initiator. %adm-InitiatorManagerEmail% - the email address of the manager of the operation initiator. %name% - the name of the group. %member% - the distinguished name (DN) of the new member. %adm-InitiatorFullName% - full name of the operation initiator. %initiator% - user logon name of the operation initiator. %adm-OperationDescription% - the description of the operation. To send notifications in HTML format, select HTML in the drop-down list located to the right of the Message field. To edit the message text in a visual HTML editor, click the HTML Editor button. 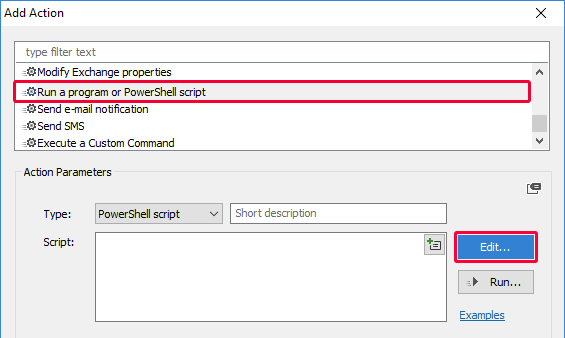 It is also possible to send email notifications using a PowerShell script. To send an email message from a script, you need to call the SendMail method of the predefined PowerShell variable $Context. $subject = "New Member Added to %name%"
To send email notifications only if certain conditions are met, right-click the action and select Add Condition. Example 2 - If the initiator is not a member of the group to which new member was added. In the Template field, enter %distinguishedName%. Value reference %distinguishedName% will be replaced with the DN of the group to which new member is added. All Objects - select to send notifications when a member is added to any group in any domain managed by Adaxes. Specific Domain - select to send notifications when a member is added to any group within a domain. OU or Container - select to send notifications when a member is added to a group located in an Organizational Unit or container. Group - select to send notifications when a member is added to a specific group, or a group that is a member of the selected group. Business Unit - select to send notifications when a member is added to a group that is a member of a Business Unit. To select a Business Unit, open the Look in drop-down list and select the Business Units item. 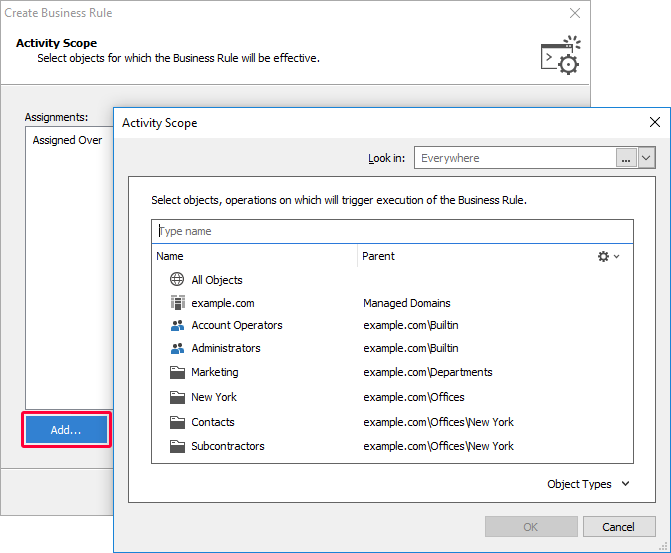 You can exclude groups, Organizational Units and Business Units from the activity scope of the Business Rule. 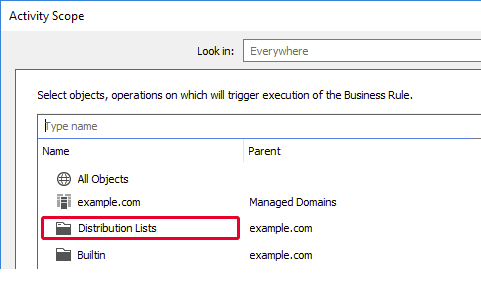 For example, if you've assigned the Business Rule over all groups in a domain, but do not want it to be executed for groups located in a specific Organizational Unit, you can exclude the Organizational Unit from the activity scope. 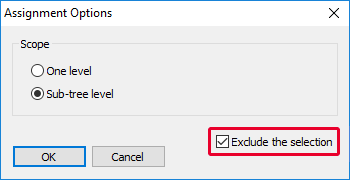 To exclude an object, select the Exclude option in the Assignment Options dialog box.